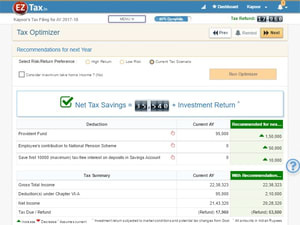 Plan / Save Taxes while you File with EZTax Tax Optimizer. Save maximum taxes and get the biggest possible tax refund every time you file your income tax return. All you have to do is to choose EZTax self service, at the end of the questionnaires, before you e-File, tax optimizer provide recommendation to make changes for next year. Tax Optimizer assumes your current income levels for next year, and ask simple questions like whether you want low risk or high return, further ask whether you have specific amount that you do not want the tax optimizer to consider for tax optimization. That's it! Use those recommendations to plan for the next assessment year! During this process, EZTax does the real-time calculations to show you refund before and after making the change. Get the biggest possible refund. Simulates the current income levels for next year. Show potential refund with real-time calculation engine. Shows today vs to-be analysis.